Camping with kids has its own set of struggles and stresses, but it doesn’t need to be avoided, just planned for. There are a lot of articles available that talk about camping with kids, such as when is too early, what type of gear to bring, etc. etc., but I want to focus on my own preferred camping method, so here are a few tips on hammock camping with kids. Kids tend to love hammocks. Almost immediately they are playing, overturning, or swinging. The biggest challenge is to keep them from going crazy, especially the younger ones. So my first tip is almost obvious: play it safe. If possible, pitch hammocks over clear areas and at a safe height for entering and exiting for their size. Falls and dips should be expected, but you can minimize the hurt. 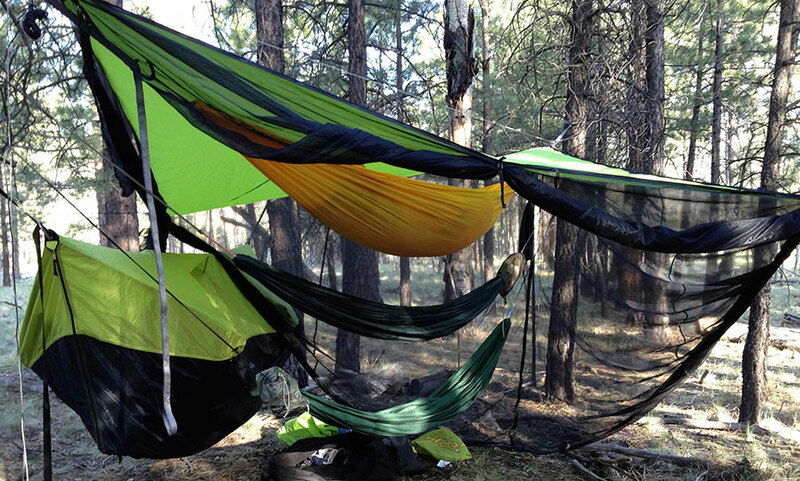 Use hammocks with sturdy material, such as parachute nylon, that are more durable. Use no-nonsense suspension to make set-up easier but also eliminate the possibility of failure if done wrong. 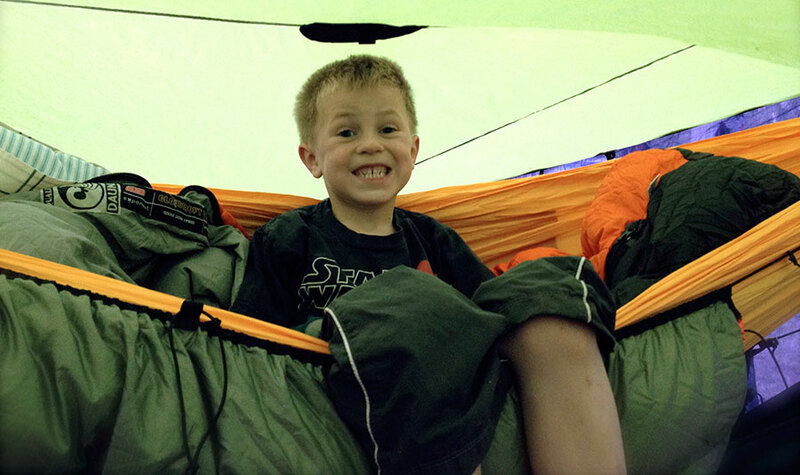 Whoopie slings, toggles, buckles, rings, and Marlinespike hitches may be all the rage with die-hard hammock campers, but they can be tricky and prone to error if done incorrectly, especially with young kids or inexperienced hands. Instead, use climbing carabiners and daisy-chained webbing straps that don’t require any cinching or safety knots. 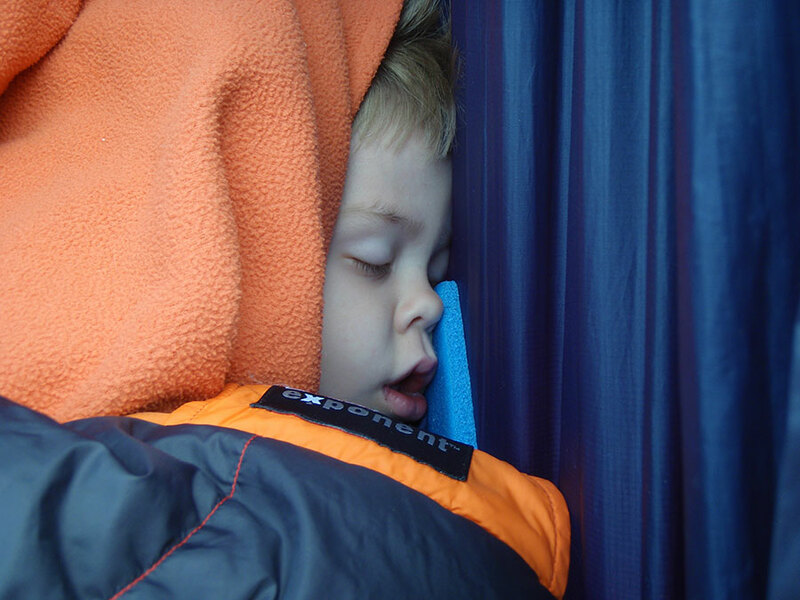 When I first went hammock camping with my kids, I lost a lot of sleep because I had to tend to their insulation to keep them warm when top quilts, under quilts, and sleeping pads failed (usually kicked-off or flipped out). A few times my last resort was to bring them into my hammock, resulting in my kids getting some sleep, but leaving me zombified by morning. One thing I’ve learned about hammock camping with youth over the years is to minimize potential issues, particularly with insulation. When I know my kids will stay warm through the night, I sleep a lot better. 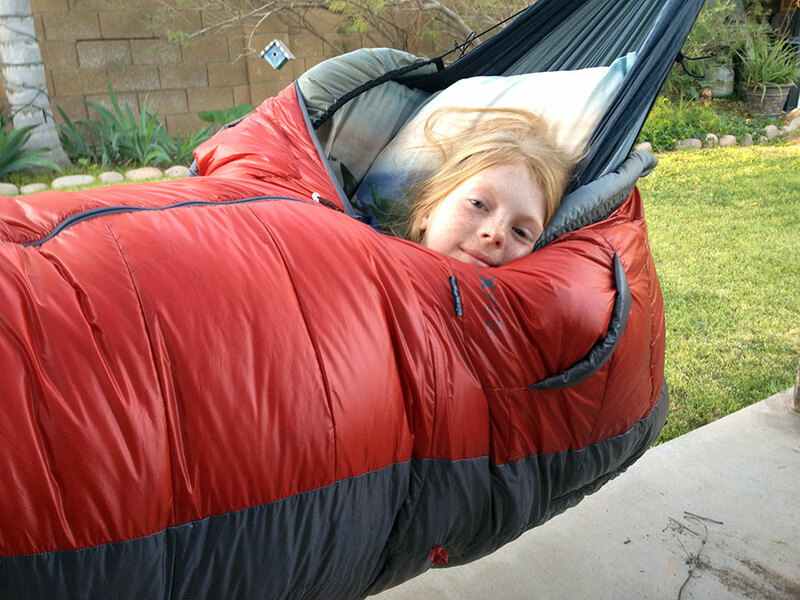 When I’m not backpacking, I prefer to have my kids use synthetic sleeping bags that don’t compress as easily as down, that way if they happen to roll or move off a pad or under quilt, the bag will provide enough insulation to keep them warm since they are light enough not to compress the insulation much. Under quilts can also be difficult with kids because they can slide off when they move around. One solution is to use quilt hooks that clip the under quilt securely to the hammock and prevent it from shifting or falling off. Shorter 3/4-quilts are nearly full-size for children, so there is no need to buy full-length quilts. Pads also work well, if used correctly. I slide the pad inside the sleeping bag, which prevents the pad from slipping or falling out of the hammock and ensures the occupant remains on the insulation through the night. Hammocks with double-layered bottoms that can hold a pad in place are also a good option. If you’re like me and you only have “big” sleeping bags for your kids, another thing you can do is stuff the end of the sleeping bag back into the bag. Not only does this shorten the bag, but it also provides a little extra insulation for the child. Having hammocks with zippered bug nets is another way to keep insulation from falling out or getting shifted in the night. When I’ve used simple gathered-end hammocks on family trips, almost without fail one of my kids will lose his sleeping bag off the side. One of the reasons is that all my sleeping bags are sized for adults (I’d rather invest in a high-quality sleeping bag/quilt my kids can grow in to than buy several “child-size” bags over the years), and the excess bag simply becomes a sinker off the side. A bug net helps keep these bags from falling out. The zipper entry is also more convenient to access than crawling up under a bottom-entry, or trying to open up a cinched tube net (see next tip). Avoid using zipper-less tube-style bug nets, for both you and your kids. 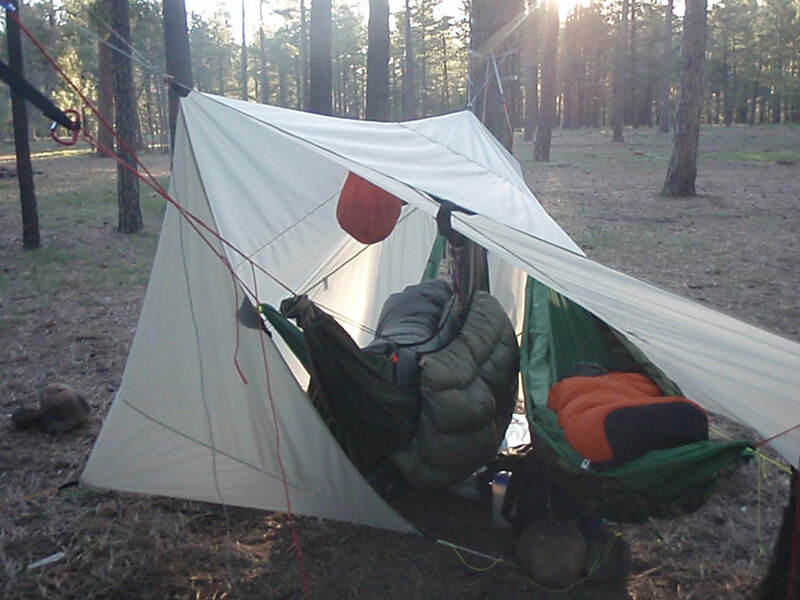 Ultralight tube-style bug nets completely enclose the hammock and occupant but are difficult to get in and out of, particularly in a hurry. 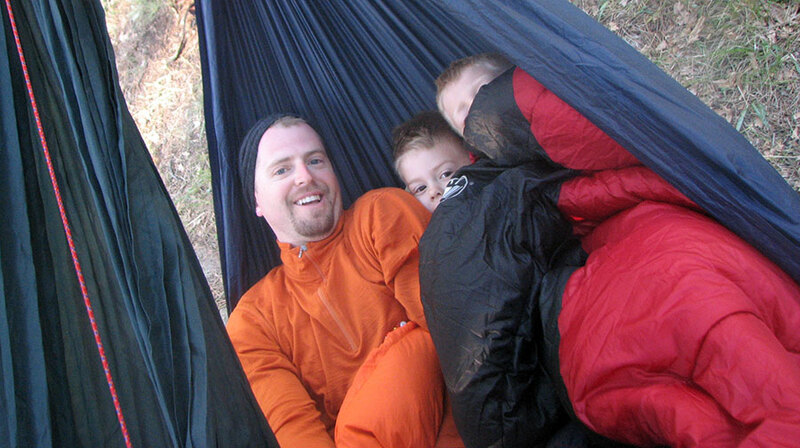 One of the reasons I designed the HUG bug net was to allow me to get in and out of my hammock quickly so I could attend to my kids (usually bathroom breaks) in the night. Add highly-visible zipper pulls to all your hammocks. If you need to get out and get in to a hammock in a hurry in the pitch black of night, give yourself a hand by marking your zippers clearly. In an “emergency” (usually a midnight bathroom break) I only have moments to react, so fumbling for a flashlight isn’t the first thing I’m doing. 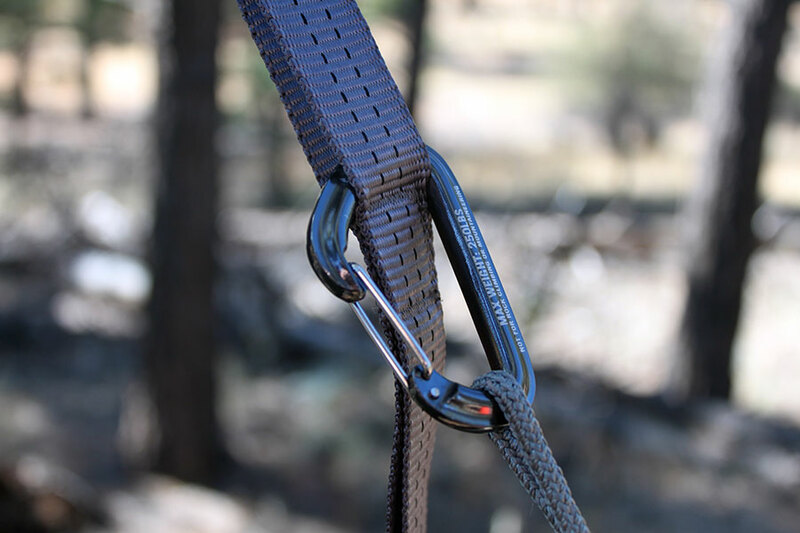 Most reflective string and zipper pulls still use black cord with a tracer, which are nearly invisible when it is dark and only work when light is shining on them. I prefer to use bright, contrasting colors that are more visible in the dark, and I keep the pulls long enough so I can grab them with ease. Everyone gets their own hammock. Solving the “warmth” issue was the major key to keep my kids in their own hammock throughout the night. While it may be tempting to snuggle up in a single hammock, I’ve found that lasts just a few minutes before arms fall asleep, insulation is stolen, or discomfort arrives in the form of a foot or shoulder in the back. Hang hammocks close together. In my experience, kids like to be close (just not in the same hammock), often for psychological reasons. Hanging close also makes it easier and quicker to address problems. I have stacked as many as four hammocks side-by-side and bunk style for my kids. There have been a few times when I was able to stay in my hammock and reach up to my kids to help them, even pulling one down for a bathroom break while I stayed in bed. Try that in a tent! Get a big tarp, maybe even a winter-style tarp with doors. It’s important to protect a child’s privacy, especially when changing clothes or getting ready for bed. A large tarp can also cover a few hammocks, keeping everyone close and snuggly. Finally, a full-coverage tarp can provide the psychological “wall” that some kids need to separate the scary outdoors from their imaginations. While not particularly just for hammocks, these ideas have kept the outdoors experience enjoyable for my kids. Battery-powered LED lights are always fun on camping trips. Stringing them up on my hammock tarp creates a visual landmark in the dark so my kids can find camp if they’ve been out playing. The “nightlight” is also comforting and a distraction before going to bed. Some hammock vendors sell brightly-colored quilts (sometimes by request) and hammocks that appeal to kids of all ages, and may make the experience that much more enjoyable. When appropriate, have breakfast in bed! I usually do this when it is cold outside and won’t be staying another night in that spot (food smells can linger, so it’s not a good idea to cook meals at your bedside if you’re staying multiple nights in one spot). I’ll let my kids snuggle warmly in bed while I serve them a hot meal. 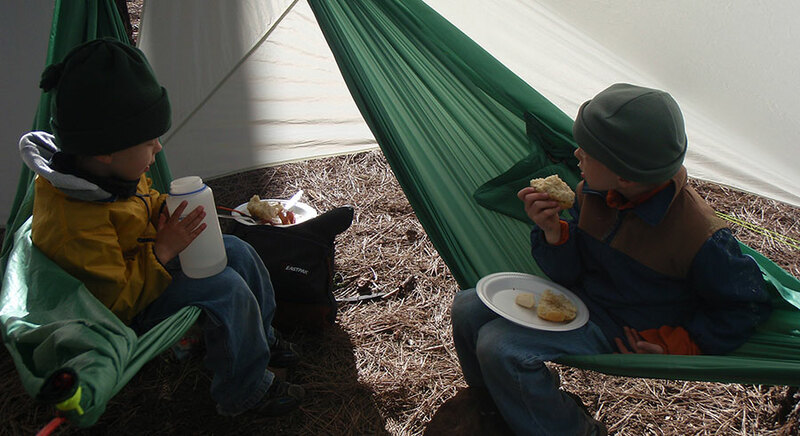 Leaning over the hammock while eating prevents food spills from getting on sleep gear. Thanks Mike! In the photo with the Nemo Bugout shelter, I’m not in a RR, that’s the Eureka! Chrysalis hammock. It’s a bridge hammock with modular bug net and “Campersleeve” that combines a tarp and bug net enclosure. It’s similar in design to the Warbonnet sock, but on the Chrysalis, it’s a fully-functional, waterproof tarp. Pretty slick. Great Job, very informative and enjoyable to read. Thanks Derek. Your book helped alot when I first started. Since then my boys are now starting to hang. Thaks again! Great post. I’m working to get hammock camping going in our troop. Not only have you shared ideas which helped getting my set up going but this will help within the troop. Keep up the great work. If I stubble across anything I think of I’ll be sure to pass it along. Thanks Dave. Another thing we do with our troop is bunk the hammocks, which the boys really like. They get to sleep near each other and share a tarp. I’m preparing a trip report for our 50-miler this summer where you can check out photos. I am going to be giving this a go this fall or as soon as it cools down a bit. Great page, looks like your family is having some really good times. Thanks for all the info, you addressed my concerns. I will be taking the large tarp to create the wall that shuts out the scary darkness and hanging her close so she won’t want to climb in with me. I could already see that wasn’t going to fly. Thanks for your efforts and sharing! Great ideas, Derek. Of course, as you probably know, Hennessy makes a good hammock for younger people with their Scout. Anyone under 6 foot would fit in. It comes in either the regular or the zip entrance and like all Hennessy hammocks comes complete with an attached mosquito net and a good sized rain fly. Derek. I liked your book very much. Your drawings are very nice and do a great job getting the point across. What size hammock would you recommend for children or people under 5 ft (1.5 m)? My point being one can save on material and weight by making a more size appropriate hammock. Thanks Rolando. I understand your concern about saving some material, but it is only short term, especially if you plan on making bigger hammocks when the kids grow. If you want to scale down, try making a hammock that is 4-5 feet longer than the occupants height. The width should be half the length. I liked this article so much that I made my hubby read it. I like to call myself the original hammock camper. I have been camping since I was in diapers. I am now 36. I have been hammock camping for the last 20 years and my family has been laughing at me ever since. I have been laughing at them as they spend hours setting up tents, blowing up airmattresses or cots and all the other crap they bring. Once I started having our 4 kids, the oldest is 7, they have all been in the tent and I have been ham mocking it outside. Ha! This year they are all finally on board. This coming week we will be FINALLY taking no tents and crap, only hammocks and tarps. Yippee!! I am a photographer with 4 autistic kids aging 7, 6, 4 and 2. My husband is 31. I have been a hiker, kayaker, camper canoe er my entire life and have spent the last 7 years “training my family to do these things with me. Hammock camping will lighten our load so very much which is a nessecity becUse of the camera great I have to pack in. Check out our site http://www.hurricanejeffries.com to see how it goes next week and some of our other pages for how we survive our special needs family. LOVED the article so much and after my husband read it he agreed to do only hammocks next week when we hit up Red River Gorge. Yeah! Thanks! I’m glad you enjoyed the article. It sounds like you have a similar set-up as my own, in regards to having a “big” family (compared with today’s standards). Good food for thought. I enjoy taking my kids on short backcountry hikes here in the PNW. I’ve got my young girls into hammocking and their small enough I usually have them sleep in the same hammock. I’ll have to try bunking them in separate hammocks and the other suggestions you gave. I took my six year old even snow caving and shehad a great time because she slept warm. A cold or wet night of rest can stay with kids for a long time. I’m also a Scout leader and I haven’t pushed hammocking on the scouts. They’re almost always wet in their walmart tents. The northwest will put your gear to the test constantly. One wet tent campout was enough to convert my troop to hammocks. Wet camping is about 60% of our experience so I’ve told kids and parents that the cheap tents and gear will not work around here. I should start pushing hammocking to the boys since our scout master is also into it. Just wondering how you get into that top hammock? Looks like it is 7 feet off the ground. The top hammock was only about 5 feet off the ground. I lifted and placed my son in and out of the hammock. There was no fear of falling out since the Mayan style hammocks have such a low center of gravity and high sides that they can’t simply roll out; they have to intentionally climb out. Great write-up Derek, now if only I could convince my daughters that camping doesnt mean taking the RV we’d be all set. What 4 season tarp are you using? What is your recommendation for a multi-person tarp? There are lots of options for 4-season tarps. A basic 10×12 tarp with multiple tie-out points (like from Jacks R Better) can be pitched down into a roomy, fully-enclosed shelter. I also have a cuben fiber winter tarp from HammockGear.com, and the Wilderness Logics Tadpole tarp with a door mod. It is a smaller tarp, but still provides more coverage options with the doors. For multi-person, it’s nice to have a larger tarp, like a 10×12. Underground Quilts has a nice winter dream tarp that can fit two people side-by-side and has integrated doors. If you stack, there are even more options available. How young do you and your readers start using hammocks? Have toddler and wondering how young is too young due to things like neck position and heavy blankets, more so than the risk of falling out. If you ask some cultures, like the folks down in Mereda, Yucatan, Mexico, their children sleep full time in a hammock. My 5-year-old loves sleeping in a hammock. When hung properly, the hammock provides a low center of gravity, making it difficult to flip out. It also provides a flatter laying position, so there are no neck kinks or twists. As with all things, there are risks. I wouldn’t put a heavy blanket or put infants in a hammock without supervision. Use good judgement and be wise! how do they get the hammock out the bottom of the sleeping bag? I read the article and it never said. once that’s resolved, I see this 100% as working. I’m not quite sure I’m following you on this. Please clarify. This is great! I want to take my kids on some multiday cycling trips from next year (they’ll be 3 and 5) and hadn’t considered hammocks instead of tents. It’s something to look into, for sure. The tip about sleeping bags (stuffing the ends back in the bags) is really excellent too. I was about to get a child bag for me eldest but like your idea way better. Some great ideas, thank you!